Hackett's latest future-focused speech revolved around the need to share transportation to reduce congestion and pollution. LAS VEGAS -- Ford Motor is expanding its mobility vision from the self-driving car to the cities it expects them to operate in. 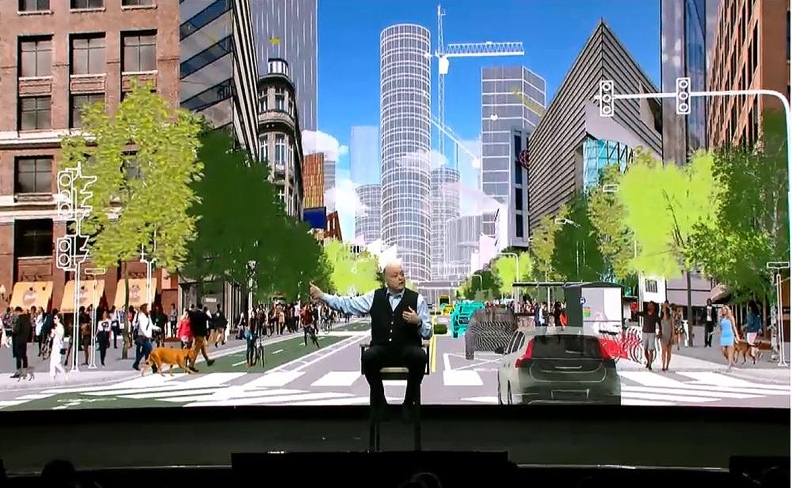 In remarks at his keynote speech Tuesday at CES, Ford CEO Jim Hackett stressed the need for shared transportation and smart infrastructure to improve city functions as technologies such as autonomous driving and connectivity develop. He and other Ford executives introduced a swath of partnerships and an autonomous vehicle deployment strategy aimed at addressing these goals. Hackett has been gradually outlining his view of future mobility since taking over as CEO last year. In August, he discussed his expectations for a slow ramp-up to fully autonomous vehicles at a Ford mobility event in San Francisco. In an October lecture in Grand Rapids, Michigan, the CEO talked about the obstacles to consumer trust. Hackett's latest future-focused speech revolved around the need to share transportation -- using car-sharing, ride-hailing or public transit -- to reduce congestion and pollution. The message of sharing is also a tenet of recent Ford partner Lyft, whose carpooling service now makes up 40 percent of the ride-hailing company's trips. Hackett focused on the transition period between human-driven and self-driving cars, and said he wants to deploy Ford autonomous vehicles to supplement human-operated ride-hailing services and help them expand to underserved areas. In addition to Ford's autonomous pizza delivery pilot with Domino's, Jim Farley, Ford's head of global markets, said the automaker will partner with delivery app Postmates to further develop driverless delivery services. "We’re working on a new self-driving business model," Farley said. "It’s a systems-based approach, transporting both people and goods." Ford is also expanding its vehicle-to-infrastructure capabilities, working in collaboration with Autonomic -- a software startup the automaker invested in late last year -- to build a cloud network for vehicles, infrastructure and pedestrians to communicate. Don Butler, Ford’s executive director of connected vehicle and services, said Ford will also use Qualcomm’s recently introduced cellular vehicle-to-everything platform, to enable connectivity with a wide range of other technologies. "Ford's vision for the smart city is an interesting premise, but at this point it's not much more than that," Jessica Caldwell, executive director of industry analysis at Edmunds, said in an e-mail. "Bringing this smart city to reality will require significant municipal cooperation and investment, and it remains to be seen if local governments share Ford's ambitions. It's admirable that Ford is taking a philosophical approach and is looking at how connected vehicles can change society for the better, however, this future is a long way off. In the meantime, Ford has an opportunity to better articulate how they're going to improve the lives of car shoppers today."